taken from mama g's blog...written by michael g on september 22. worth the read. michael, thank you for opening your heart and sharing this journey with everyone who loves you and your family. 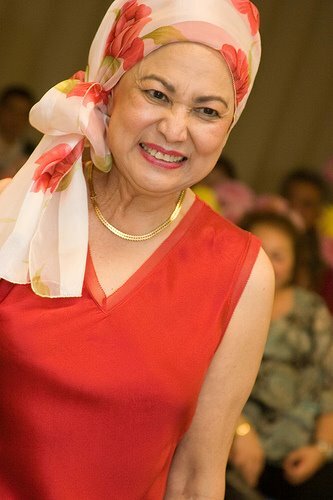 It is kind of difficult at times to see mom like this, when just ten days ago she was radiant at her birthday party. She has been saying things like…“Take care of your father” and “I love you very much”… like she is saying goodbye. The song, “You raise me up” came on the TV and she asked me what part of her funeral she should have that played. At one point she was going to say something, but got emotional and stopped. I will say that I feel lucky to have gotten to spend very deep, and meaningful one on one time with mom. I can honestly say that I may not have ever spent this long of a period holding moms hand and just looking at her, if it wasn’t for this cancer. This afternoon, mom was restless, but I find that she calms down and sleeps better if you hold her hand, or rub her head, or even sit next to her, and let her sleep on your shoulder. I plead with God throughout the night to heal mom, or if need be, give me the pain and disease in exchange for her health back. I would give anything to have her healthy again. Just last Saturday, mom and I went on a “date” to a Thai restaurant in Tacoma. Mom ate well and we had fun. Kids spend time with your parents as soon as possible. Hold their hand, look them in the eye, and tell them how much you love them. and to my own mom and dad, who are 2000 miles away right now, i love you. I find this blog, I read some posts. But this one full me with different feelings, sad and happiness in same time. Sad about story and life how can be difficult, happy about strong wish in hearth for hope for better tomorrow. I just say, never give up and use every second of life to spend time with yours love ones and tell them how much you love them.